My brother spends hours alone on the rock, climbing massive, grand stretches of granite and sandstone, belaying himself, cleaning his own gear, climbing back up. The last time he returned from a 1200 foot solo climb in Zion, there was a look in his eye I couldn’t quite understand. In my teens, I was a climber. 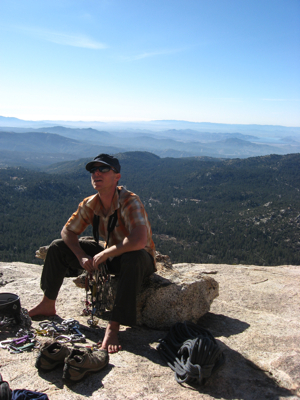 I’d regularly take the lead-end of the rope, guiding friends up steep pitches of jagged Joshua Tree rock, or teaching others to build sound anchors or to use certain techniques for overcoming tough moves. At one point, my three friends and I even shared aspirations of climbing El Cap, the 3300 foot monolith of Yosemite Valley. But some time in the last decade I got “The Fear.” As I imagined too many possibilities that could result from being 100 feet off the ground with a 10 mm rope as my only insurance, climbing stopped being fun. It turns out this is a phobia that other friends and climbers have caught. Regardless of my irrationality, when I return to California for vacations, my brother motivates me for a flashback to my teenage climbing urge. The day before New Year’s Eve, I found myself tied to his rope, climbing shoes snugly on, harness secured tightly around my waist, helmet wrecking my carefully styled bed head. Over the next two hours, we would climb about 300 feet of Tahquitz granite. As Daniel started the first pitch, the aching stomach and the tense shoulders overtook my body. Did I really want to do this? The Fear had returned. When he left the ground, I felt a sense of commitment to follow him, something I’ve always been inclined to do. But I ran into the precarious Fear again quite quickly. Near the top of that first pitch, Daniel explained to me that I would need to climb slightly above his last piece of gear and then traverse. He said something else after that, something that would have helped, but I heard the word traverse and stopped listening. In the rational world, traversing is not that big of a deal. But my wandering mind focuses on the fact that if I fall on the traverse, I’ll pendulum. The thought of a pendulum 120 feet off the ground, swinging over granite, doesn’t sit well. I hear Daniel tell me to take my time, and I hear myself respond to him with some quietly mumbled un-pleasantries. I climb higher than he anticipates, and I forget to clean the last piece of gear he secured. That leaves me now making a traverse above his belay. My irrationality led me to a place with an actual bit of danger. I should have stayed on the ground. I arrive awkwardly at the belay station. But I arrive. We exchange gear, make a few comments about how fun and beautiful this is (I’m lying a little bit to him about the fun), and some moments later, he’s making his way up the 2nd pitch. I follow his every move to the “step-over,” another precarious little traverse where for the smallest of moments your legs dangle over 200 feet of pure exposure. Marveling at his calm, smooth ability, I turn inward. What am I doing here? Why do I put myself through this? Aren’t there better ways to travel? Like putting one foot in front of the other? Or skiing? Or driving a stick shift at 5 o’clock in the evening through L.A.? He spends time building what’s called a “bomber” anchor. There’s so much gear in, he assures me, that we could hang an elephant. Not that we would do that; that would be demented. At least I’m thinking clearly through all the adrenaline. Suddenly, I’m on-belay and climbing up towards the looming step-over. Halfway up this 2nd pitch, I find a section of beautiful granite crack that calls for a layback, one of my favorite climbing techniques. I start to feel a little bit better. I might finally be relaxing, if even just slightly. At the step-over, the Fear returns some and Dan intuitively gives me a few hints before I clean the last piece of gear. Once again, I’m on a traverse, on the climber’s edge. The pendulum is an ever ready possibility, so is success. So is death. I step across and yell out what can only be described as a loud, triumph roar, less lion-like, more of a squirrel that’s found a new stash of acorns in the dead of winter. I’m safely below the rope again, no risk of pendulum, just 200 feet of wide open fresh air beneath me, and another 100 feet of glorious rock climbing up cracks and face moves and stunning earth ahead of me. I see the rock through new eyes, those eyes of a climber not sensing the fear, or any of its leg-shaking cousins. In a word, I’m soaring. There’s a freedom in climbing that I haven’t found in any other mode of travel. It’s a simplicity, an emptiness, a calmness (as long as we can clear away all the clutter and actually find it). At the end of the climb, Daniel and I celebrate the fun and the beauty (for real this time). I appreciate his willingness to drag me out of bed and lead me up another incredible climb as he’s always so eager and generous enough to do. And I see that look in his eye that was there after his last solo. I realize I might have that look as well. It didn’t take 1200 feet of climbing though, just a simple wander up some vertical granite. This entry was posted in At Home in California, Different Modes of Exploration, Travel and tagged Fear, Idyllwild, Rock Climbing, Tahquitz. Bookmark the permalink. I can feel the fear! Awesome account of a great morning. Cheers! Climbing is definitely a high in more ways than one.